Pete Royea’s love of cars runs deep. “I've been into cars since I was about 6 years old,” Royea explained. “My oldest brother got me into cars.” Growing up, Royea and his family moved all around the world. While in boarding school, he always kept in touch with his brother who was living in Canada at the time about cars and car culture. Despite Royea’s and his brother’s best efforts to convince their parents to buy the 1989 Miata, they needed something more practical (they in fact bought a 1989 Nissan 240SX). On the way back from the funeral, Pete’s wife suggested they purchase an MX-5 Miata as a tribute to his brother. Pete thought it was a great idea. “It had to be a 1990 mariner blue one,” Royea said. “It had to be that first car that we talked about so much at the Chicago Auto Show.” Royea eventually found one locally that had just crossed 50,000 miles and was a hundred percent stock. Royea initially purchased the Miata as a hobby car for he and his wife to share, but over time it became a real contest for who got to drive it every day. During this time, Royea also started looking into upgrading the car, but his wife was insistent that he not touch the car as it’s 100% original. So, Royea purchased a 1992 Sunburst Miata with 38,000 miles on it, sight unseen, for his wife. “I immediately solved our issues of not being able to decide who got to use the car and gave me a chance to actually go and start figuring out how to work on a car,” Royea explained. 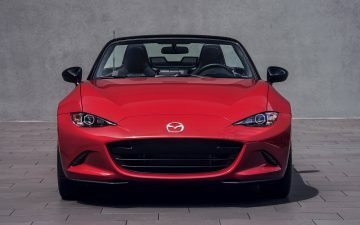 Royea’s passion for the Miata has extended to others in his family, including his son who now drives a 1991 Miata, as well as his nephew who is now on his second Miata. “There’s a spark of passion about these cars for sure,” Royea said.